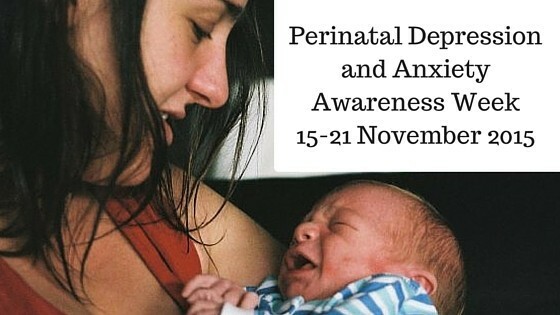 So, this week is Perinatal Depression and Anxiety Awareness Week (From the 15th to the 21st of November). I’m going to write a few posts on the topic and publish them throughout the week, but I thought I’d start by sharing a bit about why this week is really important to me. Firstly, I think it’s spectacular that this week has actually had a recent name change. It’s previously been “Postnatal Depression Awareness Week”. Which is also very important to raise awareness for but talking just about Postnatal Depression (PND) excludes other types of perinatal distress. Anxiety and depression are becoming more recognised in both the antenatal (during pregnancy) and postnatal (after birth) periods. This is something that is very personal to me, because I experience Postnatal Anxiety 7 years ago, before I’d even ever heard of Postnatal Anxiety. I knew about depression – I had a fair idea of what the symptoms of Depression might look like (especially considering a number of people in my family have had various forms of Depression) and I wasn’t experiencing any of what I associated with depression. The tricky thing with Anxiety is the symptoms can be extremely varied between people – sometimes it can present like depression, sometimes the two go hand in hand. For me, outwardly, Anxiety looked like I was coping with motherhood really well. I was active, I was out of the house most days, I was shopping, I was having coffees, I was keen for people to come visit me – I was super mum. I was doing everything myself. I was reading all the books. I was putting on makeup every day. I smiled. I had everything handled. I wore makeup because I didn’t feel safe without a mask. I smiled so nobody would ask me if I was really okay. I did everything myself because I felt like everyone was watching me, waiting for me to fail. I read everything I could because I felt like I didn’t know what I was doing. And I went out everyday because I couldn’t be alone with my son. I had persistent and intrusive thoughts of something happening to my baby, including a constant fear that I might hurt him myself; which I have since learned is a common symptom of Postnatal Anxiety. It makes sense – I perceived everything as a risk to my baby. I vividly experienced cars swerving out of control across the footpath into his pram. I was afraid of fans falling from the ceiling on top of him. I imagined tripping with him in my arms as I walked down the stairs. I saw my perfectly healthy thriving baby sickly and dying in my arms. And I saw myself throwing him off the balcony. NONE OF THESE THINGS WERE REAL, or even a remotely realistic. But I was just afraid that something – anything – might happen to my baby. I didn’t know what was wrong with me – or that anything was wrong with me. The guilt, the worry, the stress – I’d been told was a normal part of motherhood. And it is sometimes, but not to that extent. Not to the point of having heart racing terror multiple times a day. And another big clue that something wasn’t right with me, was I was often unable to sleep, even when my baby was sleeping. I’m so grateful that when my son was 6 weeks old, he was having a particularly fussy evening and my partner asked me “What’s wrong with him?” A simple enough question, but in my mind he’d confirmed that something was wrong with him. So I went the very next day to see the Maternal and Child’s Health Nurse, to find out what was wrong with my baby. And she more or less looked at him, looked at me, and handed me a brochure about Postnatal Depression and told me to call the number on the back. I took it home and actually laughed to my partner about it. I told him it’s silly – I don’t have depression. But I still contacted that psychologist. She specialised in perinatal mood disorders and she told me about Postnatal Anxiety. I can’t adequately describe the relief I felt in that moment. It was incredible to find out that there was actually something wrong with me. And that it wasn’t my fault. And I wasn’t a monster. And most of all it was relief to know that I could get better. That this wasn’t just how motherhood would be for me. That I would still be able to bond with my baby; that sometimes it takes time – and that’s okay. I learned that there were things that I could do to help sort through the thoughts in my head and that there were strategies I could use to help self soothe if I started to become overwhelmingly anxious. So that’s my story and that’s why I’m passionate about raising awareness for all kinds of Perinatal Distress – which both mums and dads can experience at any time throughout the perinatal period; because the hardest part for me was not knowing. The next important thing to know is where to get help. You can talk to your doctor, your midwife, your Maternal and Children’s Health Nurse, or contact PANDA (Perinatal Anxiety & Depression Australia) they have a national Helpline, that operates Monday to Friday, 10am to 5pm – their number is 1300 726 306. For more information about what they do go to their website www.PANDA.org.au. I will be writing a couple more things throughout the week and possibly next week because I’m going to be trying to organise my own Lunch Out Loud event in the next week or so.